In the mood for lemon tart? Try your hand at this this particularly lovely lemon meringue tart, a deconstructed approach conceived by Khanh-Ly Huynh, a Parisian chef. 1. MAKE the crust, then pipe the lemon curd and meringue in varying sizes. In the photo, all of the lemon curd is piped with a large tip; the meringue is piped with both large and small tips. The result: an edible work of art. 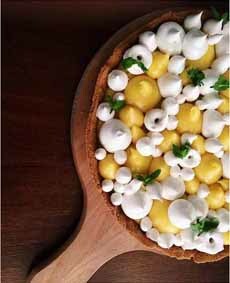 The entire tart filling is piped rounds of lemon curd and meringue (photo courtesy Khanh-Ly Huynh). 2. BAKE in a 425° oven for 3 to 5 minutes, until the meringue is lightly browned. Cool to room temperature. If you wish, you can follow this recipe for lemon meringue tart. DO YOU KNOW THE DIFFERENCE BETWEEN A PIE AND A TART? There are several differentiators. Here they are.